A record crowd filled the Bren Events Center for Homecoming 2012 on Saturday, Jan. 28 as 4,382 spectators watched the UC Irvine men’s basketball team win their second consecutive game after defeating the UC Riverside Highlanders 65-57, in a down-to-the-wire match. The Anteaters improved their overall record to 8-13 and moved to the .500 mark with a 4-4 record in Big West play. Junior guard Derick Flowers led the Anteaters in scoring with 17 points and finished 7 of 8 from the free-throw line with the majority of those free throws coming in the final seconds of the game. Junior Adam Folker also continued his superb play, nearly posting his second career double-double with nine points and nine rebounds. Seven of his nine points came in the final two minutes of the game, including a couple clutch free throws and some huge offensive rebounds. The Anteaters opened the game with sloppy play. The ’Eaters committed five turnovers in the span of four minutes and allowed UCR to jump out to an early seven-point lead. Irvine received a much needed boost off the bench from freshmen Mike Best and Will Davis II. Best contributed on 3 for 4 shooting for seven points. Davis came in and scored five points and pulled down five rebounds in a short span. His energy and defense pumped up the crowd and helped Irvine take the lead on a 16-5 run. Junior Mike Wilder was also terrific in the first half, knocking down his first three shots from beyond the arc and scoring all 10 of his points in the first 20 minutes. His stellar shooting promptly sparked the appropriate “Af-ro Thun-der!” chant by the crowd. As a team, the Anteaters shot a respectable 48 percent from the field, 50 percent from threes and won the rebounding battle in the first half. They took a 32-29 lead into the second half. 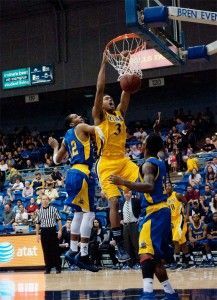 An Irvine 9-2 run to start the second half pushed the lead to 41-33, but was quickly answered by UCR’s run of their own. By the 12 minute mark, the Highlanders had knotted the score up at 41 all. Both teams would exchange baskets until Riverside began to break away with a 51-47 lead. With 2:33 remaining in the game, UCR saw their last lead at 53-51, as the Anteaters closed out the game with clutch shooting. The young Anteaters maintained composure and continued to play aggressively on both sides of the court, causing turnovers on defense and getting to the free-throw line on offense. The Anteaters would score 12 of their 18 final points from the free-throw line and end the game on a 12-2 run. The UC Irvine men’s basketball team ended a three-game losing streak and got a much needed win at home on Tuesday as they defeated non-conference foe, Seattle University, 78-67. The Anteaters were led by freshman Will Davis II, who had the best game of his young career. Davis saw extended minutes on the floor after Chris McNealy picked up to early fouls. He finished the game on 9 of 10 shooting with a career-high 21 points, 10 rebounds and five blocks. It was an up and down game between Seattle and Irvine, indicated by the 142 field goals attempted and 101 rebounds the teams combined for. UCI came out flat to begin the game, shooting 3 for 11 from the field and missing all three of their 3-point attempts. The tempo of the game picked up early as Seattle got in a running match with Irvine. After Seattle took a 16-13 lead in the first seven minutes of the game, the Anteaters went on a 16-3 run to take a 29-19 lead. The Anteaters’ aggressive defense held Seattle one for 11 from the field and forced six turnovers in that span. Seattle cut the lead to seven before half time, but Irvine’s defensive intensity contained Seattle to 33 percent shooting. Junior Adam Folker was superb rebounding the basketball, pulling down nine first-half boards, limiting second opportunities and allowing Irvine to push the ball up the court. Freshman Travis Souza also played quality minutes in the first half, making great passes in the open court and creating scoring opportunities in transition. The second half featured the same up-tempo play. Both teams exchanged baskets for the first 10 minutes, but Seattle was never able to narrow the Irvine lead to under three points. The Anteaters clung onto a small lead until Will Davis took over the game in the 7th minute. Trailing 55-50, Seattle looked to make it a one-possession game, but was denied three consecutive times in the paint by Davis, who tallied all five of his blocks in the second half. On the loose ball the Anteaters pushed the ball up-court to Flowers, who missed the fast-break layup, but was put back by Davis, who was hustling down the floor. Davis would score nine of his 21 points in the final five minutes of the game. Overall, the Anteaters had a balanced scoring night. Chris McNealy was effective in the second half scoring all 13 of his points, after only playing two minutes in the first half because of foul-trouble. Adam Folker pulled down a career-high 15 rebounds, seven of them offensively, to go along with seven points. His hustle and toughness in the interior was key as Irvine out-rebounded the 12th ranked rebounding team in the nation, 52-49. Junior Derrick Flowers, who only scored four points, did an excellent job running the Anteater offense and taking care of the basketball by committing only one turnover.